Cook Shire, an area of 106,121 sq km, comprises much of Cape York Peninsula, extending northwards from Ayton on the east coast and from a little north of Pormpuraaw on the Gulf of Carpentaria. The Weipa township has been severed from the shire, along with Aurukun, Hope Vale, Kowanyama, Lockhart River, Mapoon, Naprunum, Northern Peninsula Area and Pormpuraaw Aboriginal Shire Council areas. Ludwig Leichhardt traversed the southern part of the shire in 1845 and Edmund Kennedy travelled north, almost to the end of the peninsula in 1848. Killed by Aborigines, his papers were virtually destroyed when found, and little information survived of his expedition. Increased shipping through Torres Strait persuaded the British and Queensland governments to establish a port and refuge for shipwreck victims, and they chose a site on a small inlet on the eastern side of the tip of the peninsula. Named Somerset, it was proclaimed in 1864. The brothers Frank and Alex Jardine overlanded cattle from Rockhampton, an epic journey of exploration and fatal confrontations with Aborigines. Alluvial mining exploited the granitic geology along the Palmer River, finding little or nothing in the extensive sandstone country running up to the north of the shire. Over on the western side, the red coastal cliffs had been noted by Matthew Flinders in 1802, and 150 years later they were identified as the world's largest deposit of bauxite. Known as laterite, the bauxite deposits are formed by heavy rainfall dissolving minerals and leaving insoluble aluminium hydroxide in the top three to ten metres, overlain by shallow soil and scrub. The site is ideal for strip mining, and the Weipa township is based on the mining and export of bauxite, mainly to Gladstone. 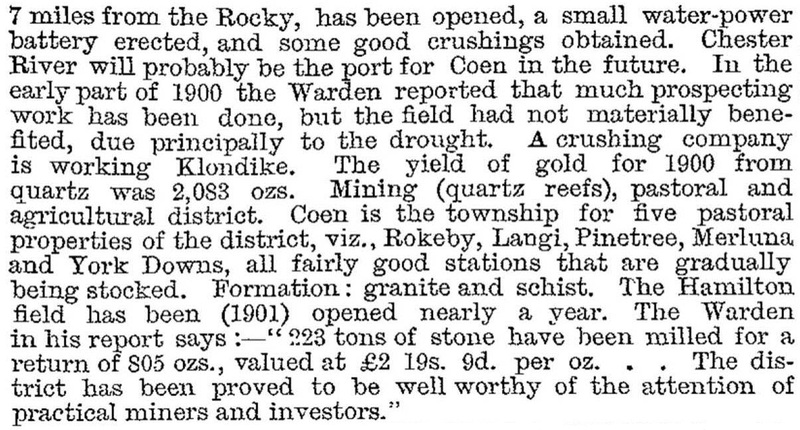 The Palmer River goldfield had several townships, Maytown being the administrative centre of the local Hann Shire (1879). 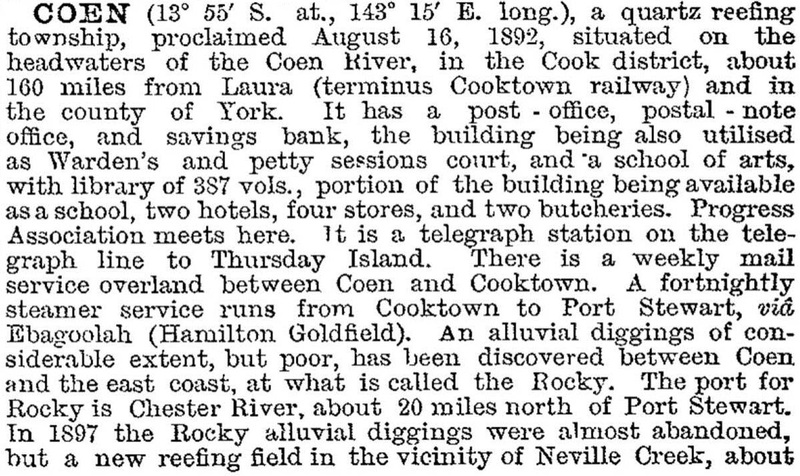 The goldfield's port was Cooktown (incorporated as a municipality in 1876). Hann Shire and Daintree Shire (1879) were amalgamated to form Cook Shire in 1919. By then Hann Shire and Cooktown each had a population of about 1000 people, well below the twenty or more thousand of the goldrush days. Daintree Shire had even fewer, and the combination of all three (as Cook Shire) resulted in a little over 3000 in the 1921 census. Cooktown was united with Cook Shire in 1932. The population number would have been larger if Aborigines had been counted in censuses, and larger still if the depredations on their population by mining communities had been stopped. An influenza epidemic in 1922 worsened their plight. There is ample evidence of healthy pre-contact Aboriginal societies, best seen in the rock art and cave paintings in the Quinkan Reserve (immediately north of the Palmer River Valley) and east of Laura. It ranks as one of the world's best and largest collections of prehistoric art. There are several Aboriginal communities: Aurukun, Napranum (Weipa South), Mapoon and Bamaga (west coast); and Wujal Wujal (Bloomfield), Hopevale and Lockhart River in the east coast. At the 2011 census the Indigenous population amounted to 20% of the total populations of Cook Shire. Despite the somewhat scanty pasture lands in Cook Shire, their sheer size aided by supplementary feed methods enabled over 130,000 head of cattle to be held in 1993. Field crops, fruit and vegetables are also grown. The largest employment sector in Cook Shire in 2011 was local government administration (9.6%) followed by accommodation (7.7%), school education (6.3%), fruit and tree nut growing (5.3%) and sheep, beef cattle and grain farming (4.8%). * 1257 (Cooktown), 732 (Hann Shire) and 623 (Daintree Shire), total 2612.